Of all the reasons for the Knicks' semi-bi-weekly resurgences — the latest data point of which was a breezy 106–87 win over the Toronto Raptors last night — our favorite is that interim coach Mike Woodson gave the team an ultimatum. As ZagsBlog paraphrased Amar'e Stoudemire: "The way Amar’e Stoudemire tells it, his new coach gave the Knicks an ultimatum. Play harder, play with more energy on both ends of the court — or else." Oooh ... or else. "Or else what?" you ask. Or else Woodson would force the fifteen players on the Knicks roster to undergo a nationally televised battle for the death? Or else Woodson would withhold team porridge? Or else Woodson would require all players to have his precise facial hair construction? What is it? Whatever it is, apparently it's working! It's a little disturbing that the answer might be as simple as "Carmelo feels like playing defense now," but whatever; until the honeymoon inevitably ends, it's pretty fantastic for now. The Knicks looked terrific last night, suffocating on defense, swarming, slap-happy, forcing tons of transition baskets, and generally looking precisely like the team Mike D'Antoni had been trying to make them look like for three and a half years most of the last month. The pace is a tad bit slower than D'Antoni might like, but this is the way it is supposed to work. The fourth quarter last night was an ongoing, self-sustaining reel of giddy fun. 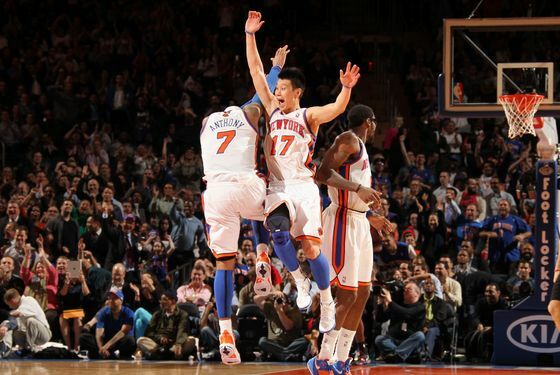 Oh, and hey, who's up for some more Linsanity? Okay, so maybe the mere mention of the term brings a weary sigh by this point, but it has to be noted that Lin is playing as well as he has all season. He was terrific last night — after yet another facial contusion; is it a league requirement that he be punched in the head once a game? — and even drained a couple of three-pointers. It was a platonically balanced rotation last night, with six players in double figures. Lin was one of them, with seventeen, and also had ten assists. Baron Davis may or may not return tonight, but Lin appears to have raised his game. Again. Also, Amar'e Stoudemire is beginning to look like he has rediscovered the ability to move, drive, and/or dunk. That will come in handy. Also, Toney Douglas played! Congrats on the new kid, Toney! So, that's four in a row. But there is no rest for the suddenly defensively aware. In fact, tonight might be the most important game of the last fortnight. The Knicks travel to Philadelphia to face the 76ers, a team they're suddenly only four games behind for the Atlantic Division lead. (And the No. 4 playoff seed.) A home loss to the 76ers a week and a half ago was the next-to-last straw for Mike D'Antoni, but this, like always, is a different Knicks team. The Knicks can get within three of the Sixers with an easier schedule over the next week or so, and hold off those charging Bucks, who happen to be as hot as the Knicks are right now. Last night was silly fun. But tonight, the Knicks can make a real statement. Yes, another one.